Date: August 27th - September 7th, 2009. Location: Minnesota State Fair, 1265 North Snelling Ave., St. Paul, Minnesota 55108, USA. 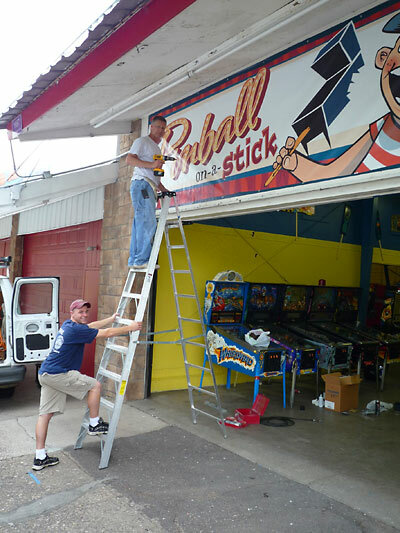 Inevitably, you have to answer the question what exactly is "Pinball-on-a-Stick"? First, what it isn't. It's not something to eat. Sorry. What it is, well that's not too difficult to answer, but you might want to know the rest of the story. Flash back to early 2009. 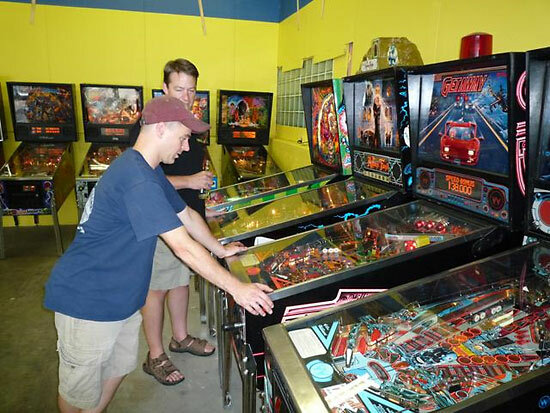 It began at a pinball-related party with Kris Boettcher (a new amusement operator at the Minnesota State Fair) and Brian Millard (a former route tech and avid pinball collector) discussing the ever popular Minnesota State Fair over a cold one. 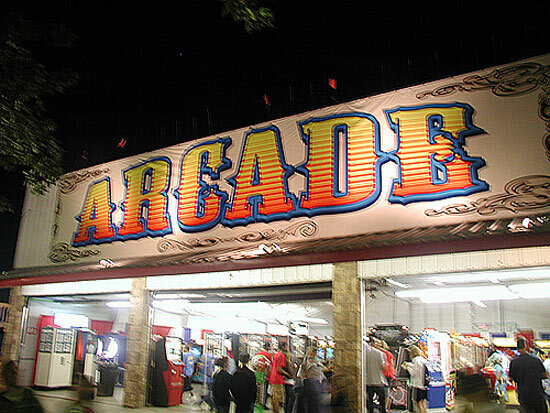 Kris had a room in his building at the fairgrounds knows as "The Arcade" that was formerly operated as "Toddler Town". 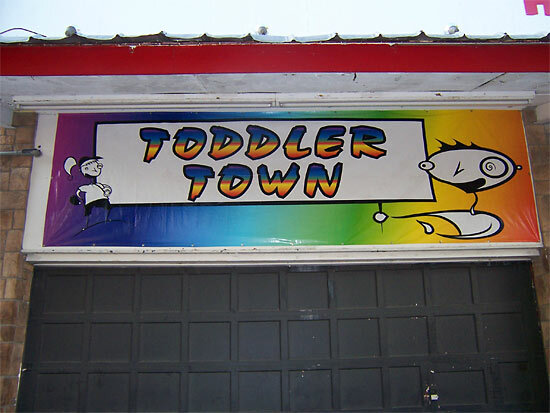 It housed about a half-dozen kiddie rides that never made a whole lot of money during the Fair. He wanted to do something different with the space this year. 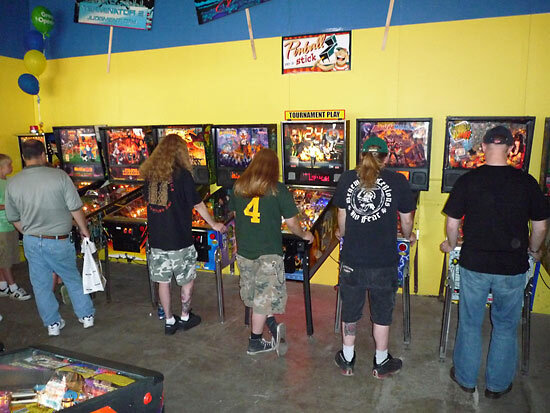 After a couple more beers, they started thinking about how cool it would be to have a room with all pinball machines. Kris was used to hearing day after day at the previous fairs that there just weren't enough pins. After talking that night, it was obviously just a pipe dream, but a seed had been planted. Months later, and having mentioned the idea to other Minnesota pinheads, the wheels were set in motion. The proverbial ball began rolling about a month before the Fair gates opened. 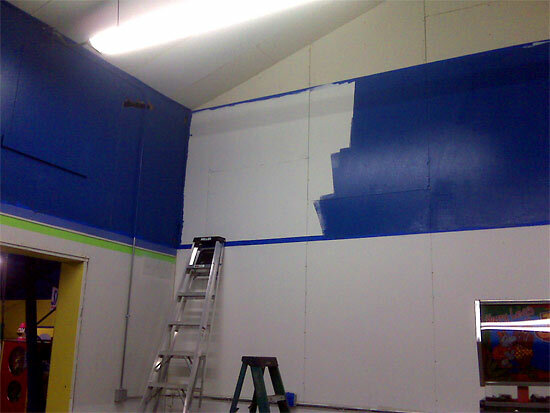 The space was dirty, there were piles of junk in the room and the walls had holes with really bad paint. Not deterred in the least, they got the room cleaned, painted and began figuring out a lineup of machines. 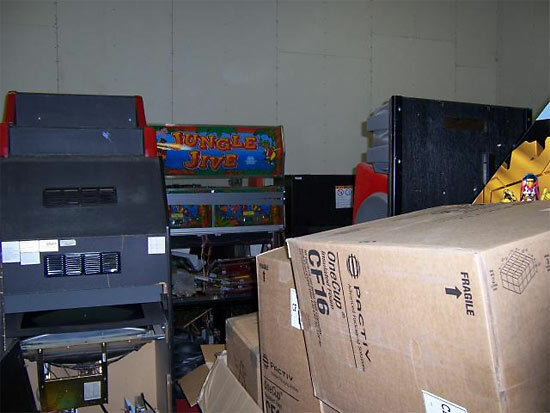 After a lot back-breaking deliveries, around 20 machines owned by Brian, 7 from Kris, and another 3 EMs from Jason Rufer (another local collector), the game room began taking shape. 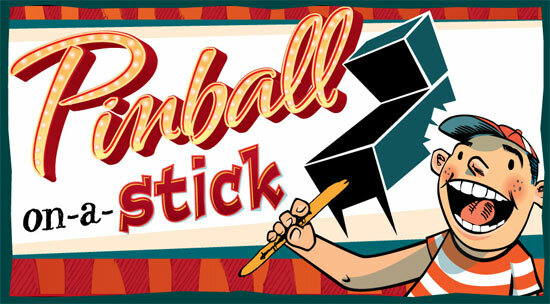 The Pinball-on-a-Stick name came from a suggestion by Vince Birdsley, who also created a web site and t-shirts to commemorate the event. Matt McKee did the artwork/logo while a significant amount of electrical work and decorating was done by Bryan Kelly. Ryan Marincovich and many others helped shop, level and set up the games. 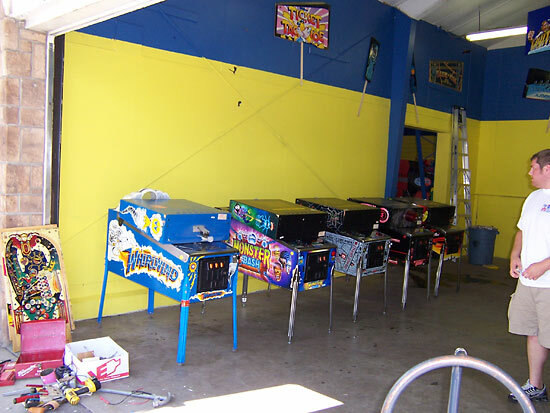 Pulling together a pinball game room in 30 days is no easy task, and while not all the names of those involved can be listed here, there is long list of great people that lent a hand to get P-O-A-S off the ground. 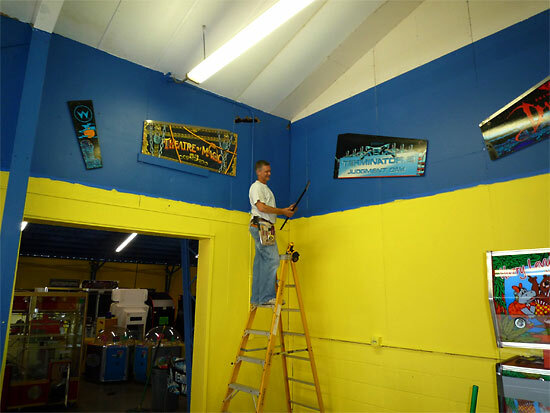 Be it a little electrical work, a website, a logo, some painting, shopping games, or breaking backs moving games. The full list of people involved in some way can be seen below or at: http://pinballonastick.com/images/ThankYouSign.pdf. The night before opening, with all the games in place, tested and the audits reset, there was nothing left but to open up and see if people would drop quarters. Things ran incredibly smoothly with minimal break downs, despite record crowds of people for the Fair. The success surprised them all to say the least. To those involved, some of the most rewarding aspects of the endeavour were hearing all of the pinball stories from the patrons - sharing memories of playing this pinball or that - and last but not least, all the kids that came in and played a mechanical game, when plenty of video games were just next door. 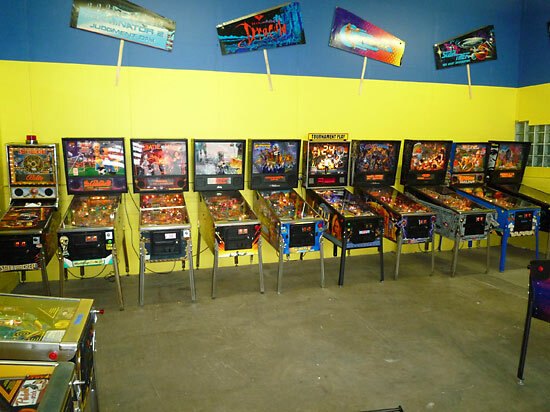 Thirty pinball machines at the Fair? Many could not believe their eyes. People were actually coming to the fair just to play pinball! And many people came back to the Fair multiple times when they probably wouldn't have otherwise. Not to mention the new pinheads both young and old that hopefully were made during the 12 days of summer affectionately knows as the Great Minnesota Get Together. 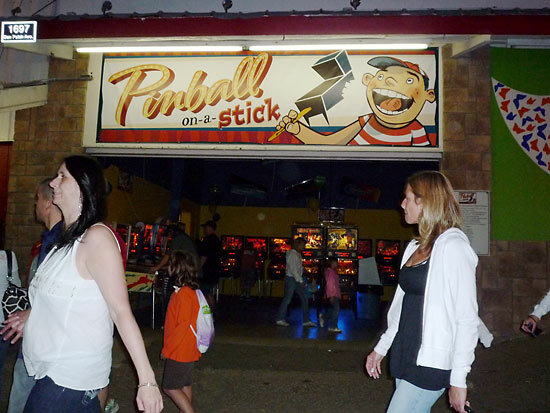 So, back to the original question -just what is Pinball-on-a-Stick? I will venture to say it's more than just some pinball machines set up at the Fair for people to enjoy. It's more so the great result of good people working together for something they believe in. 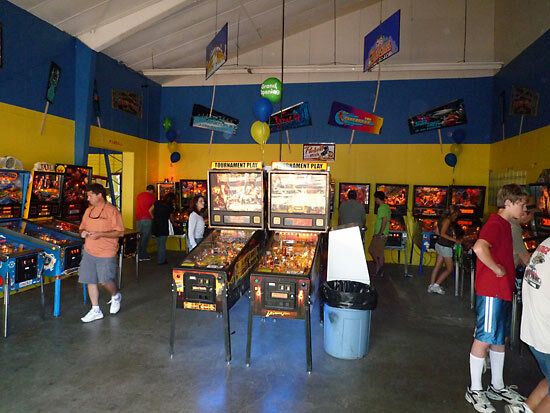 Additional pictures can be seen at the Pinball-on-a-Stick website.